Things are happening at Tiisch. Big things. New things. Amazing, delicious things. With new Head Chef Brian Miller (hailing from The Trustee and Must Wine Bar) taking over the kitchen knives from co-owner Sven Sander, both the menu and the business are getting a bit of a new direction—specifically, they’re now open for dinner, and the French-inspired menu is somewhat of a marvel. 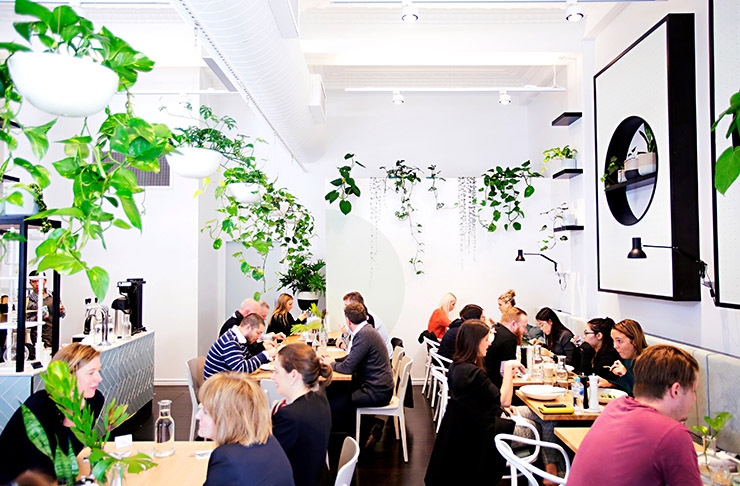 In case you missed it somehow, Tiisch is a glorious, family-owned and run cafe bistro perched on Milligan Street, and when they first opened up back in 2016, Perth smartphone owners went to town sharing shots of the place’s tall, light-filled ceilings and luscious, draping greenery all over Instagram. When you see it, you can’t blame them, and you certainly can’t help yourself. Heading in for dinner, the place is as beautiful as ever: bright whites, tonal blues and greens and candlelit tables immediately relax you, and the small team who ooze a family feel make you feel instantly at home. But Tiisch is far from being all looks. They’re known for their honest, uncomplicated, but high quality and imaginative food, and Brian’s new dinner menu is no exception to this—though it will surprise you. Combining a variety of traditional French cooking techniques with exceptional Australian produce, the menu is full of contemporary, insanely tantalising dishes designed for sharing among family and friends. Start things off with some freshly shucked South Australian oysters—they’re served up with a tangy shallot vinegar and lemon and are the most buttery, delicious oysters you’ll have tasted for a while. You also have to get a serve of the chicken liver parfait; where you might be used to lashing your parfait onto charred sourdough, Tiisch subs in toasted brioche and it’s a winning combination. Moving right along to the mains. There are two heroes on the menu: the beef cheek bourguignon and the orecchiette pasta. The beef cheek is crispy on the outside, but falls apart on the inside and absolutely melts in your mouth. It’s served on a bed of Paris mash (50% potato, 50% butter) and comes with confit onion (drool), smoked bacon and mushrooms. It’s hearty and incredibly rich in flavour without being heavy. The orecchiette pasta with mushroom is an absolute thing of beauty: it comes with a generous dollop of roasted garlic velouté (a French ‘mother sauce’ similar to béchamel) to one side of the bowl and a large handful of fresh parmigiano to the other. Stir it all through and you’ve got an irresistible dish that you will inevitably be licking clean, and possibly ordering another of. Another favourite is the confit ocean trout—it’s served with delicious, salty French lentils that are perfectly firm to the bite and house-made crispy pancetta! Pair this with the marinated green beans which come doused with whipped goat’s curd and hazelnut. Delicious. But save room for dessert. We’ve heard good things about Tiisch’s espresso crème brûlée with salted caramel ice cream, but when you find a place offering Tarte Tatin, you order the Tarte Tatin. Theirs is made with pear on a delicious, firm but flaky bed of pastry, and dished up with crème fraîche ice cream and walnut crumbs—it’s the perfect way to finish off your meal. By the way, you’ll want to have enjoyed about three cocktails by now—because Tiisch’s cocktail offering has really upped the Perth CBD game since the arrival of Brett Arendse, who’s inventive cocktails have graced the likes of Choo Choos and the now-closed Luxe Bar. You have to try the Avante Gardner, a gin-based cocktail combining peppermint and eucalyptus flavours to make a slightly sweet and sumptuous drink, as well as the Jeanne La Joie for something more on the bitter side; it combines two old French tales in its Bourbon and Peychauds, which you’ll have to ask for a history lesson on over dinner. 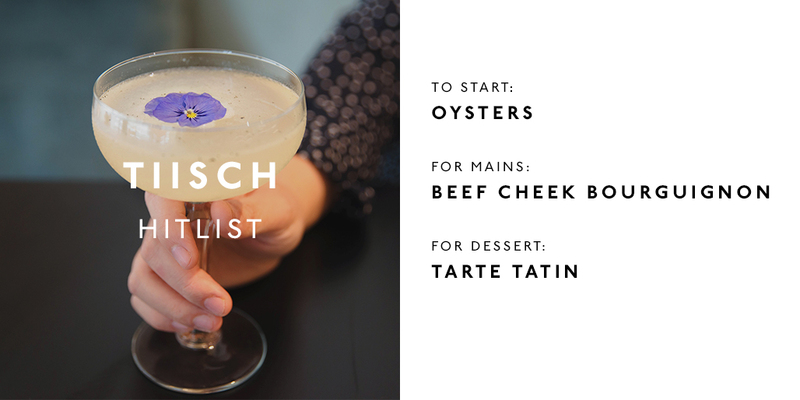 Dinner at Tiisch will not only have you completely immersed in your food, but also in your surrounds: you won’t want to leave, but when you do, you’ll be wanting to return again and again.